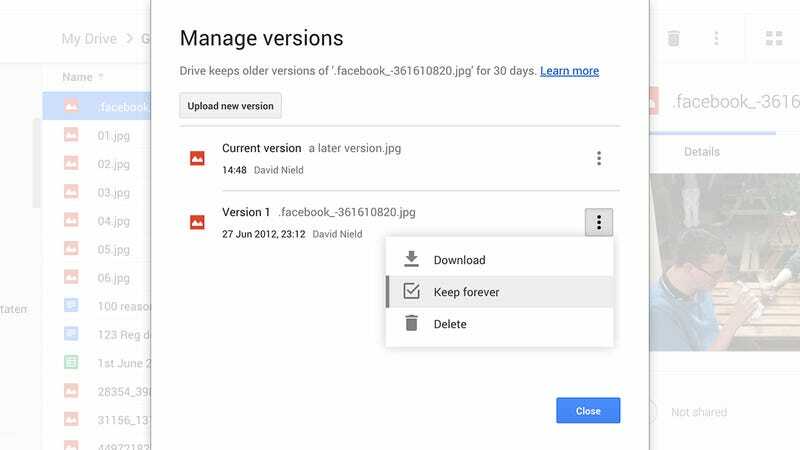 Google Drive does a decent job of managing older versions of non-native files, automatically keeping them for 30 days or 100 revisions. You can access these older versions from within the individual file options, but there's also the opportunity to keep a particular version of a file for all time if you know that you want to hang on to it. Here's where to find the relevant setting. Revisions of Google Docs, Sheets and Slides are handled from within the apps themselves, of course. Here we're talking about non-native files (like videos or PDFs) that you've uploaded through the web interface or synced through the Google Drive desktop clients. Older versions of these files are tracked and eventually deleted in order to free up space in your Drive account (see the official help page for more information). To keep a version forever, open up the file's menu. Either right-click on it and choose Manage versions or access the same menu from the More actions icon on the toolbar (three vertical dots). The subsequent dialog box lets you see the revisions that Google Drive has on record, and manually add new ones. To keep one permanently, click the More actions icon then tick the Keep forever entry. Remember this will count against your Drive storage space. In future, you can uncheck the same box when you're happy for the file to be automatically deleted.